Yes, pide … “Why now? haven’t we already got the recipe? ” And yes, I actually have posted a similar one before (you can see it right here if you want). But that doesn’t mean that you can not develop on the recipe, make other variants, etc. And to be honest, …. I was not very happy with the previous recipe. Not quite. It was just … it lacked the last color on the edges (but it’s the consequence of barbecue them. What they do not get in color, they get in brittle). So I was trying again last night together with my mother-in-law. And although it was a little hectic, it was a nice project (the dough raised so enormously, so we ended up having twice the amount of dough we planned, ie, more filling was needed, the baking time was longer etc etc ). 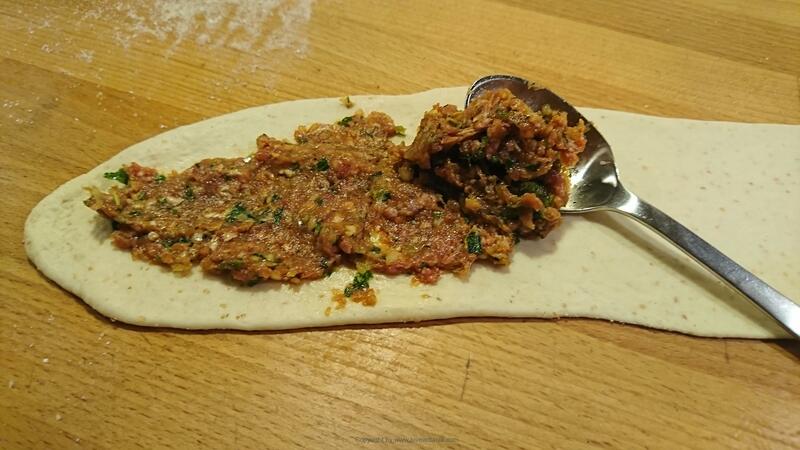 But we came through it – and have enough Pide for lunch today too (thankfully). 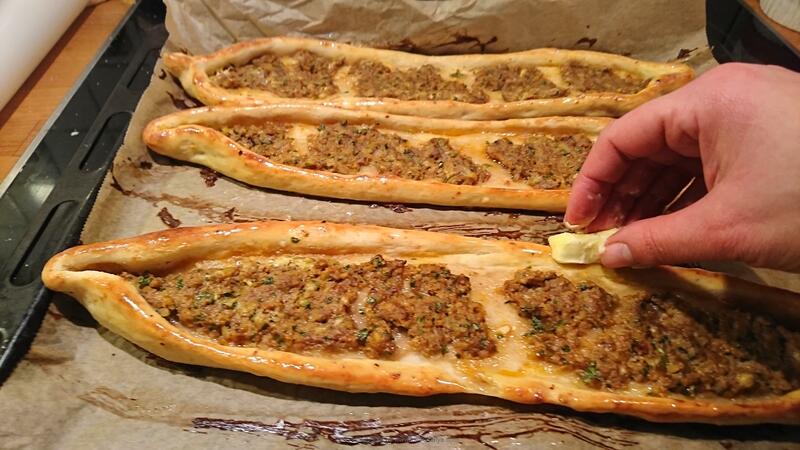 If you don’t know Pide, I can almost only presume, that you haven’t been to Turkey. Yes, honestly. 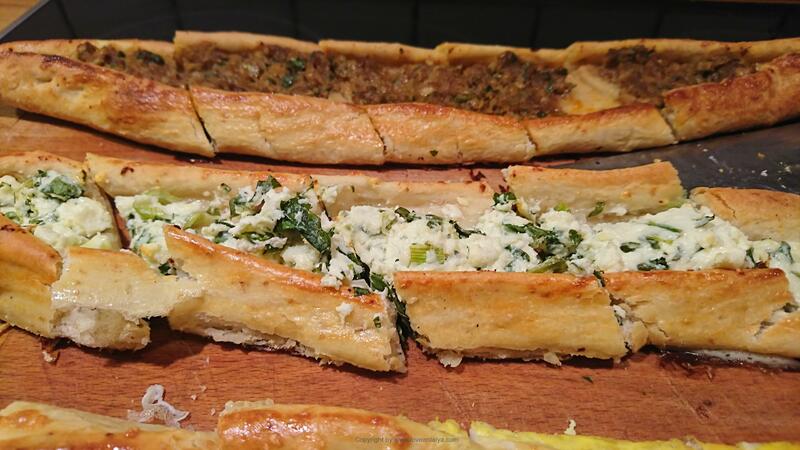 Pide is the official Turkish form of pizza (and what will Italy be without their pizza?). So it’s hard to avoid. 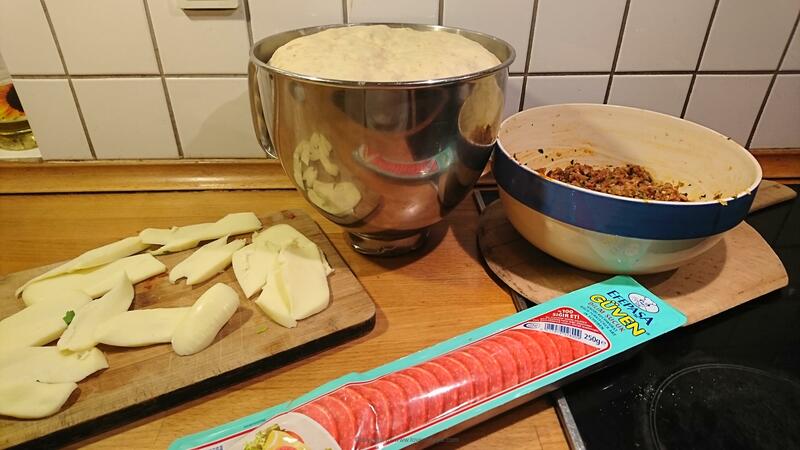 Like many other types of pizza, you can also get Turkish pide with different kinds of stuffing – minced meat, small pieces of meat, eggs, cheese, sausage (sucuk), potatoes, feta cheese etc. 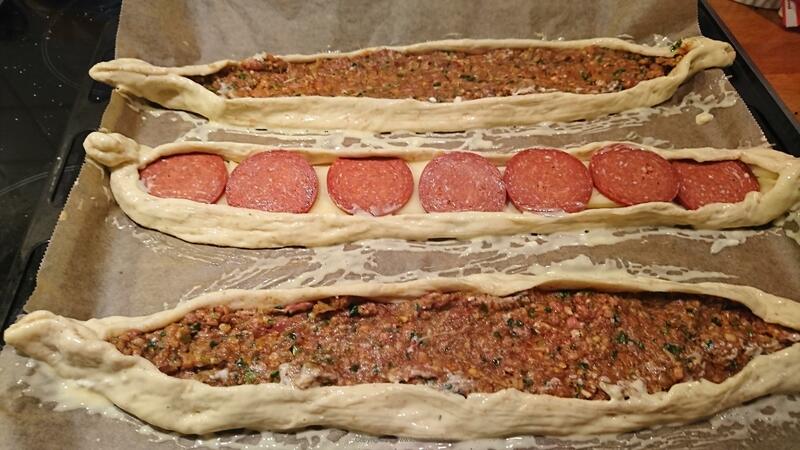 This time I have made pide with minced meat and with sucuk and cheese. When I ended up with so much dough, I had to think quick, so we also got some with feta cheese and chopped onion and green pepper. This was also very good. If you are permanently reading this blog, you may remember that my husband does not belong to the kind of people, that praises his sorroundings very much. So when he finally does, he really means it. And that he did yesterday actually. I was praised to the clouds and back again and he said it was the best homemade pide he had ever had. Bam bam … And proud I was. 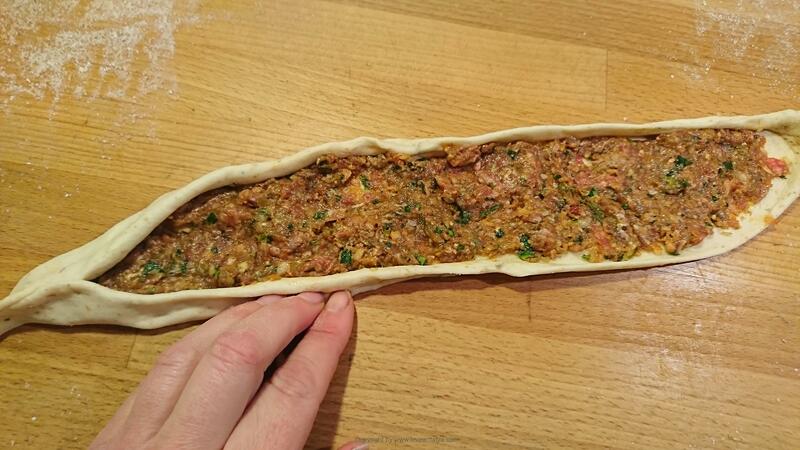 So now you get the recipe for Turkish pide again – just better than before. ½ tsp Chili, turkisk "Pul biber"
2: When it's hand warm, crush the yeast and stir around. 3: mix sugar, salt and flour - a little at a time. 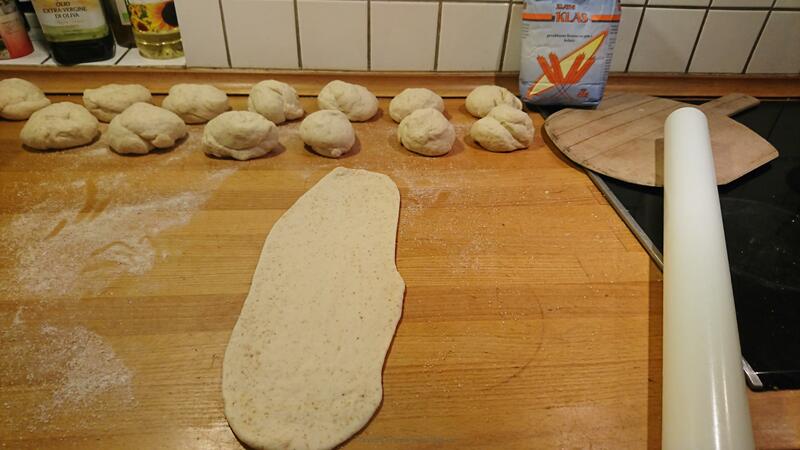 Save some flour - the dough may not need it all. Knead it - preferrable at akitchenmachine for about 10 minutes. 1: Just cut the cheese into thin slices and open the sucuk - that's it. 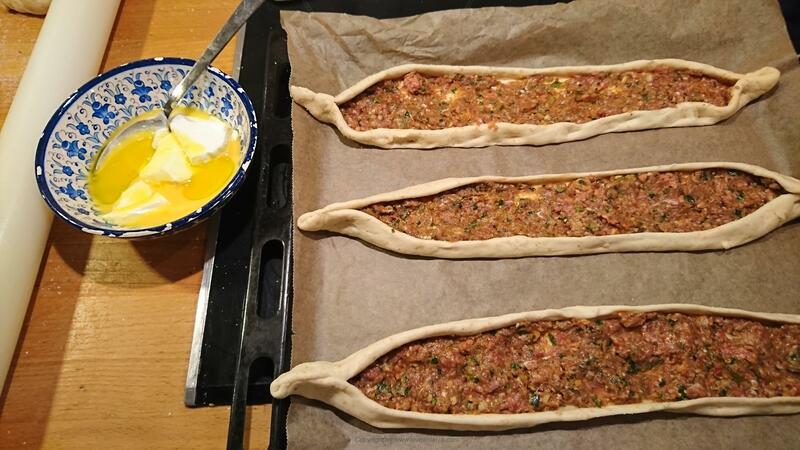 You can also add an egg or two to the top of the filling (or between the sucuks when the pide has baked a little inside the oven). 7: Bake one plate at a time for about 10-15 minutes or until they are golden on top and crisp at the bottom. Remember to serve them smoking hot - that's the way they are the best. I serve, for example, a small bean salad - Piyaz to.